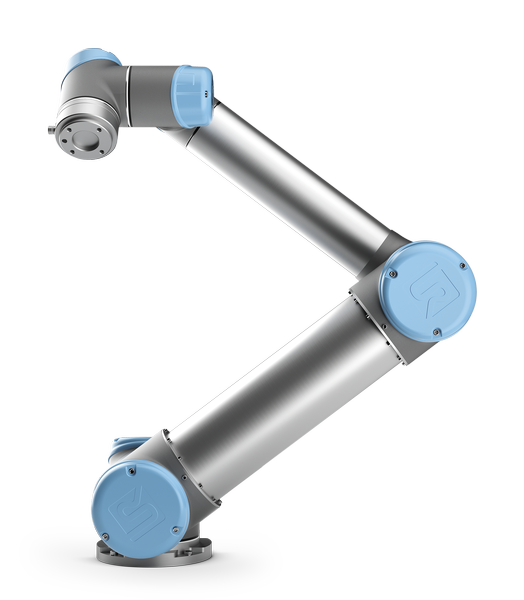 The UR5 is the industry's most popular cobot, for plenty of good reasons. The UR5 is small and lightweight, but lets you automate repetitive and dangerous tasks with payloads of up to 11 pounds and with a reach of over 33 inches. Now you can easily optimize collaborative processes such as pick-and-place, machine tending, and testing applications. The UR5 collaborative robot gives you the portability of a small robot with the long-term flexibility of the UR5's higher payload and longer reach. All that comes with the high performance you expect from Universal Robots, the leader in collaborative robots. UR5 robots can even be mounted on mobile carts that can be moved from one process to another for the ultimate automation flexibility. The UR5 is easy to program and redeploy, and programs can be reused for recurrent tasks. Like all Universal Robots, the UR5 is collaborative & safe to work alongside human workers with no bulky, expensive safety guarding (after risk assessment). It offers the same proven technology as the smaller UR3 & the larger UR10 robot arms. All three collaborative robots feature precise 0.1mm repeatability & offer one of the fastest payback periods in the industry of 195 days.